Size : 14.3 x 21.1 inches. / 36.2 x 53.5 cm. 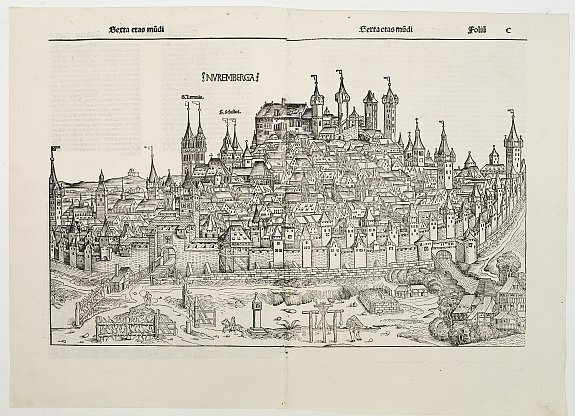 Description :Double page panoramic view of Nuremberg. As most town view in the book are imaginary views, the view of Nuremberg as being the town where the book was published, the view must be one of the few accurate. One of the earliest obtainable view of this period. Two page from the richest illustrated Incunabula, the famous: Nuremberg Chronicle , published the year that Columbus returned to Europe after discovering America. Condition : Double page wood cut. Two sheets joined. Faint discolouration along centre fold. Paper washed.